Last week winemaker Eric Chauvin took us out into his vines for our tasting. He believes fervently in organic winemaking, and wanted us to taste his wine en plein air, amid the rich earth from which they spring. The combination was magic — Chauvin’s wines pulsate with life and energy, a result of his low-intervention style and careful organic viticulture. 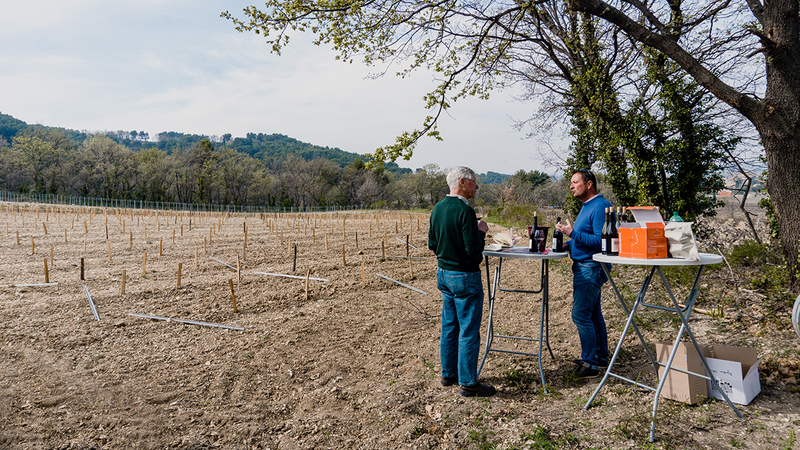 Tasting them outside brought out their vibrancy, connecting us to the millenia of wines made from the very same earth. These aren’t the fanciest or the most ageworthy wines in our portfolio. But it’s hard to think of any that are more alive. We discovered Eric Chauvin’s wine three years ago in a bistro in Séguret. It took a few days to track him down — his Domaine le Souverain has no website, no road sign, and he didn’t answer our first few calls. But after finally connecting we realized quickly what a find he was. Chauvin’s wines are intense and beautifully balanced Rhône blends that drink more like a Gigondas or Vacqueyras than the Côtes-du-Rhône pricing suggests. His 2017 Séguret is just lovely — it shows a bright nose of blackberry and lavender, with a cool earthiness that fans of the Mas Foulaquier will immediately recognize. The mouth is beautifully balanced, with softened but present tannins, clean dark fruit, and a faint smokiness in the nose. Whether you enjoy this wine on a patio, in a garden, or simply in a seat by an open window, it will connect you profoundly with the world around you.